If your dog is sick, has an injury, or is otherwise not feeling quite right, please call us before you come in for his/her regular daycare day. We'd like a chance to determine if it's OK for your dog to come play with us that day, and we'd like to save you a trip if it's best that your dog stays at home. Some health conditions are OK for regular daycare play and some require extra rest or special considerations. We continue to want to do what's best for your dog and all the other dogs in our care. Thank you for your help! Not coming for your regular daycare day? 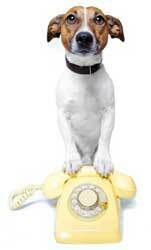 If your dog is a regular daycare attendee, please call us at least 24 hours in advance to let us know if your dog is not coming for daycare. This will allow us to plan and make staffing changes if necessary. We appreciate your cooperation and consideration. We're ready to celebrate the start of summer with a Pool Party! Join the fun June 29 - July 3. Look for sign-up sheets in the office and in the daycare building. 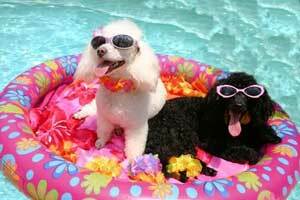 Note: Anyone who signed up for the Bunny Hop party (which we had to cancel due to the canine cough in the Valley this spring) is automatically on the list for the Pool Party. A wet collar on your dog's neck can lead to an icky itchy rash. After swimming, take off your dog's wet collar or swap it for a dry one. Wet ears are the perfect breeding ground for bacteria and yeast. 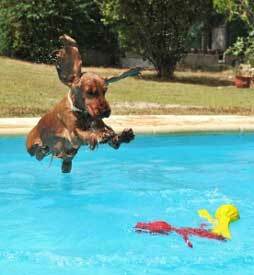 Water-loving dogs with floppy ears are the most susceptible to ear infections this time of year. Check with your veterinarian or a local pet supply store for a special ear cleaning solution formulated to dry the water out of dogs' ears to keep infections from starting. On any sunny day, the temperature inside your parked car can quickly reach oven-hot temperatures, even with the windows open. When it's just 85 degrees outside, the temperature inside your car can rise to 120 degrees or more in less than 30 minutes. 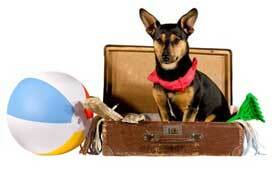 Because dogs don't sweat, they cannot tolerate heat as well as humans can. 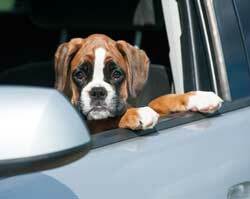 A dog left in a hot car will suffer extreme discomfort, disability or even death in a matter of minutes. 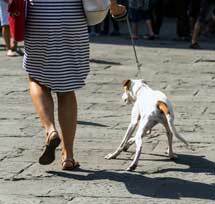 Before you take your dog out for a walk in the summer sun, take a minute to check the temperature and think about how hot the pavement will be. When the air temperature is 77 degrees, the asphalt or cement temperature can be 125 degrees in the direct sun. Yow! Your dog's foot pads are just as tender as your bare feet, so if the pavement is too hot for you to walk on comfortably, it's also too hot for your dog. When the temperature is forecast to be over 100 degrees for several days, it's tough to keep the dogs cool throughout the day. 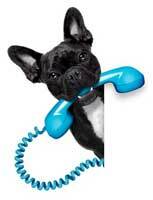 On sizzling hot days, please call to make sure daycare will be open. If you have summer travel plans and haven't yet called for boarding, act fast! We are nearly booked full on all weekends this summer. We prefer to give priority consideration to our regular boarding and daycare dogs when scheduling boarding time and will try to accommodate last-minute requests whenever possible, but when we're full... we're full! We'd like to introduce our two new staff members on the K9 Country Club crew. Michael is in charge of the "Littles" group and also takes care of feeding, exercising, and cleaning the suites for our boarders. Before joining the K9 crew, Michael worked at Pet Emergency Service. He has always had pets at home and has helped raise several litters of Silky Terriers. Michael currently has two cats. 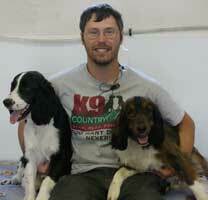 Michael is pictured here with Colt (left) and Remington (right). Halley is in charge of our "Tiny" group and also tends to our boarders' needs. Halley is a student at Yakima Valley Community College and is completing the prequisites to transer to the veterinary program at Washington State University. Halley has one dog, Moose, at home. 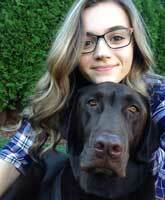 Halley is pictured here with her dog, Moose. And hooray for Jenny! Jenny just celebrated her one-year anniversary with K9 Country Club. She is a licensed veterinary technician and worked in small animal practice for 16 years before joining our crew. 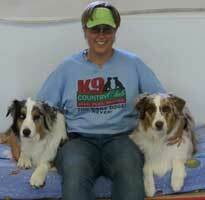 She has three dogs and four cats at home and she runs with the Big Dogs here at K9. Jenny is pictured here with Steeler (left) and Gadget (right).